Henry County is a county in the southeastern part of the U.S. state of Alabama. As of the 2010 census, its population was 17,302. Its county seat is Abbeville. The county was named for Patrick Henry (1736–1799), famous orator and Governor of Virginia. Henry County is part of the Dothan, AL Metropolitan Statistical Area. This area was colonized by various European powers, including France and Spain. After Great Britain defeated France in the Seven Years' War, it took over this area. Between 1763 and 1783, the area that is now Henry County, Alabama was under the jurisdiction of the colony of British West Florida. It was acquired from Britain by the United States after it achieved independence in the American Revolutionary War. After 1814, the territorial settlers developed Franklin as the first white settlement in the Creek territory. The former river port served Abbeville on the Chattahoochee River. 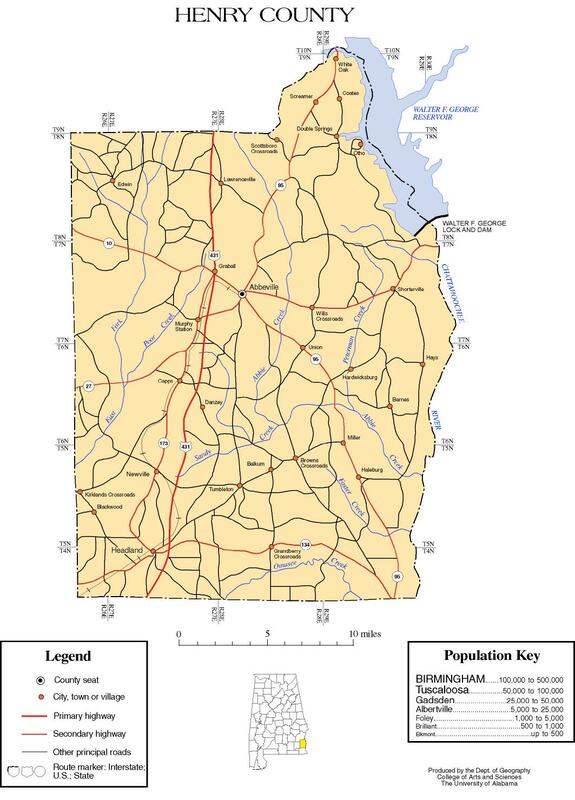 Much of the original Henry County was part of the original Alabama wiregrass region. Henry County was established on December 13, 1819 by the Alabama Territorial Legislature. The area was ceded by the Creek Indian Nation in 1814 under the Treaty of Fort Jackson. Henry County was formed before the Alabama was organized as a state. Abbeville was designated as the county seat in 1833. Henry County has been called "The Cradle of the Wiregrass". She is The Mother of nine other counties. When the county was formed December 1819, it was the largest county by area within Alabama and encompassed a vast land area that now includes the Southeast Alabama Wiregrass Region and beyond. As population increased in the region, areas of it were taken to organize the present counties of Barbour, Coffee, Covington, Crenshaw, Dale, Geneva, Houston, and Pike. December 7, 1821 - The first two counties created, in part, from Old Henry were Covington and Pike counties. December 29, 1824 - The third county was Dale which was carved, in whole, from Old Henry. December 18, 1832 - The fourth county to be created from what was once Old Henry was Barbour County which was formed, in part, from Pike County. When Barbour County was created Henry County actually gained a small parcel of land from the White Oak Creek area. December 29, 1841 - The fifth county to be created from what was once Old Henry was Coffee County which was formed in part from Dale County. December 6, 1866 - The sixth was Bullock County which was created with the southern tip of the county indirectly coming from Old Henry. December 24, 1866 - The seventh county to be created from what was once Old Henry was Crenshaw County which was formed, in part, from Coffee, Covington and Pike counties. December 28, 1868 - The eighth county to be created from what was once Old Henry was Geneva County which was formed, in part, from Henry, Dale and Coffee counties. February 9, 1903 - The last county was Houston County which 72% of its land area was carved from Henry. The balance came from Dale and Geneva counties. After Houston County was formed in 1903, Henry County had become the smallest in geographic area. This rural county was developed for agriculture and planters had many slaves. After Reconstruction, whites regained power in the state legislature and passed Jim Crow laws. They also used intimidation and violence to control the African-American population. From 1877 to 1950, they lynched 13 African Americans in the county, most in the decades on either side of the turn of the 20th century. As a consequence, Henry County is among the 805 counties where lynchings took place that is memorialized in the new National Memorial for Peace and Justice, opening in April 2018 in Montgomery, Alabama. Mechanization and other changes resulted in population losses, especially from 1940 to 1970, as many African Americans left in the Great Migration, seeking to escape the oppression of Jim Crow and gain work in northern, midwestern and western industrial cities. According to the U.S. Census Bureau, the county has a total area of 568 square miles (1,470 km2), of which 562 square miles (1,460 km2) is land and 6.6 square miles (17 km2) (1.2%) is water. It is the fourth-smallest county in Alabama by total area. As of the census of 2000, there were 16,310 people, 6,525 households, and 4,730 families residing in the county. The population density was 29 people per square mile (11/km2). There were 8,037 housing units at an average density of 14 per square mile (6/km2). The racial makeup of the county was 65.67% White, 32.30% Black or African American, 0.21% Native American, 0.06% Asian, 0.02% Pacific Islander, 1.00% from other races, and 0.74% from two or more races. Nearly 1.53% of the population were Hispanic or Latino of any race. There were 6,525 households out of which 30.50% had children under the age of 18 living with them, 53.90% were married couples living together, 14.70% had a female householder with no husband present, and 27.50% were non-families. Nearly 25.30% of all households were made up of individuals, and 12.30% had someone living alone who was 65 years of age or older. The average household size was 2.47, and the average family size was 2.95. In the county, the population was spread out with 24.10% under the age of 18, 8.40% from 18 to 24, 25.70% from 25 to 44, 25.50% from 45 to 64, and 16.40% who were 65 years of age or older. The median age was 39 years. For every 100 females, there were 90.60 males. For every 100 females age 18 and over, there were 86.20 males. The median income for a household in the county was $30,353, and the median income for a family was $36,555. Males had a median income of $29,189 versus $20,827 for females. The per capita income for the county was $15,681. About 14.50% of families and 19.10% of the population were below the poverty line, including 27.00% of those under age 18 and 20.60% of those age 65 or over. As of the census of 2010, there were 17,302 people, 6,994 households, and 4,975 families residing in the county. The population density was 31 people per square mile (11.8/km2). There were 8,891 housing units at an average density of 15.6 per square mile (6/km2). The racial makeup of the county was 68.6% White, 28.6% Black or African American, 0.3% Native American, 0.3% Asian, 0.0% Pacific Islander, 1.2% from other races, and 1.0% from two or more races. Nearly 2.2% of the population were Hispanic or Latino of any race. There were 6,994 households out of which 25.9% had children under the age of 18 living with them, 51.9% were married couples living together, 14.6% had a female householder with no husband present, and 28.9% were non-families. Nearly 25.9% of all households were made up of individuals, and 11.8% had someone living alone who was 65 years of age or older. The average household size was 2.45, and the average family size was 2.92. In the county, the population was spread out with 22.6% under the age of 18, 6.9% from 18 to 24, 23.1% from 25 to 44, 29.7% from 45 to 64, and 17.6% who were 65 years of age or older. The median age was 42.8 years. For every 100 females, there were 92.2 males. For every 100 females age 18 and over, there were 93.1 males. The median income for a household in the county was $38,379, and the median income for a family was $46,976. Males had a median income of $37,276 versus $26,771 for females. The per capita income for the county was $19,716. About 15.0% of families and 15.1% of the population were below the poverty line, including 19.7% of those under age 18 and 15.4% of those age 65 or over. Henry is currently a strongly Republican county. The last Democrat to carry the county was Jimmy Carter in 1980, and although Bill Clinton came within sixty-three votes of carrying the county in 1996, his wife Hillary won less than thirty percent in 2016 – although her vote was as good as she received in any rural white southern county due to vehement disagreement by Southern whites with the social liberalism of the Democratic Party. Except for giving Warren G. Harding and Herbert Hoover over forty percent of the vote in 1920 and 1928, Henry was before the 1960s Civil Rights legislation a typical "Solid South" county. Barry Goldwater was the first Republican to carry it in 1964. Nevertheless, in 1968 Henry was fellow Republican Richard Nixon's worst county in the entire nation: indeed Nixon's mere 1.59 percent of the county's vote against Yellowhammer State governor George Wallace in 1968 has not been undercut in any county by a major party candidate since. ^ a b "State & County QuickFacts". United States Census Bureau. Archived from the original on July 11, 2011. Retrieved May 16, 2014. ^ Scott, Marvin. "Mrs". Alabama Genealogy Web. Retrieved July 27, 2018. ^ "American FactFinder". United States Census Bureau. Retrieved July 24, 2015. History of Henry County, Alabama, hosted at Rootsweb. Henry County map of roads/towns (map 2007 Univ. of Alabama).